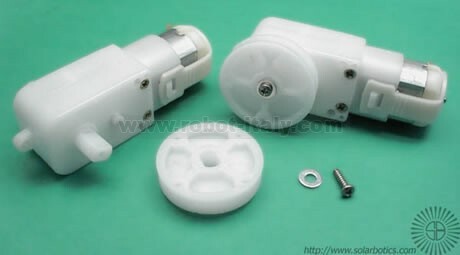 This model differs from the SBGM2 in that it has a 90 degree output shaft. This motor offers 50 in*oz of torque, rotating 360 degrees every 1.6 seconds (38 rpm - just a hair slower than a servo), at 5V, drawing 600mA at stall (free running at 52mA). With a 7mm double-flat output shaft (avoid using the "D" output - it's not meant to take rotational load), and a built-in clutch (limiting at 60 in*oz, but easily "locked"), and built-in mounting screw holes, you can see why we like these motors! Overall dimensions are 70mm (2.76") long x 22.5mm (0.886") x 37mm (1.46") including output shafts, while only weighing 37grams or 1.31ounces. Based on the original design by Mark Tilden for use in the B.I.O.-Bugs, These motors are the next generation with a variety of improvements such as dual output shafts and a lower current motor. Now comes with Wheels! 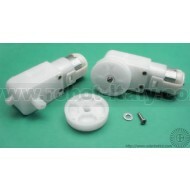 This 224:1 gearmotor is very comparable to a hobby servo for power, at a fraction of the cost! The plastich wheel is NOT included. These new hard plastic wheels are specially designed for our SBGM2, SBGM3, SBGM9 gear motor output shafts.